Yet for the first half of the season it looked as if this team would be able to scrape their way to safety and survival. At the midwinter halfway break St Pauli were 15th, 5 points off the automatic relegation places. The club resisted the temptation to attempt to buy safety in the Winter Transfer Window. On February 16th St Pauli made all their faithful supporters, in Germany and around the world, blissfully happy by going to the Volkspark Stadium in Hamburg and beating the despised HamburgSV, 1-0, in front of their own ultra right wing supporters. That win left St Pauli in midtable and seemingly safe. But alas it seemed that beating their deadly rivals exhausted their competitive spirit because incredibly that was to prove St Pauli’s last win of the season. They lost 11 of their remaining 12 games to end up bottom of the league. 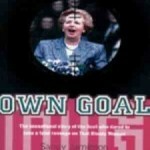 Their relegation was confirmed on the second last day with a 8-1 home defeat to the plutocrats Bayern Munich. That Bayern game had almost been played behind closed doors after one St Pauli fan let down the spirit and tradition of the club by hitting a linesman with a full plastic cup of beer towards the end of a game against Schalke. The German FA ordered that St Pauli’s last two home games should be played behind closed doors. While all at St Pauli fully accepted they deserved punishment for an offence contrary to all their traditions, they appealed against the sentence and were allowed to play what turned out to be their last two Bundesliga games before their own subdued support. Many of those present at the Bayern humiliation probably wished the club had accepted the original sentence. The St Pauli manager Stanislawski, who had served the club well for many years as a player as well as a manager announced he was leaving, exhausted. The regard in which he was held despite his team being relegated was confirmed when he was quickly appointed coach of super rich minnows Hoffenheim, the ultimate contrast to St Pauli with their status bought solely with the multimillion pound investment of sole owner Dieter Hopp. 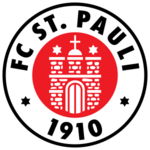 Andre Schubert, a man in the Stanislawski mould, was appointed new coach and President Stefan Orth and his Board promised the fans that St Pauli would remain true to their traditions rather than attempt to buy their way back to the Bundesliga. The club sold only one player, talented midfielder Lehmann, for half a million euros and brought in 7 new players for a total outlay of only 350,000 euros, three coming on loan, two on a free transfer and two forwards Schindler and Saglik being bought for small fees. Work is still planned to modernise, upgrade and extend the Milentor Stadium whose limited capacity was one factor in their non-survival. By 2014 it should hold 30,000, allowing 6,000 a game more than the regular 24,000 who attended every Bundesliga game. Season 2011-2012 has gone well so far as Schubert has blended his squad into an effective team. Saturday saw them achieve an impressive 4-1 victory away to Energie Cottbus with midfield star Max Kruse hitting his 6th goal of the season. So after 10 games St Pauli are in joint second place, one point behind leaders Furth and sharing second place with Eintracht Frankfurt and Fortuna Dusseldorf two of the traditional German big clubs. Proof that St Pauli are still St Pauli and different from other clubs has been provided by the fact that their attendances have remained at almost constant full capacity, the fans are still behind their unique club, in their own unique way. Two of St Pauli’s next three home games are against Fortiuna Dusseldorf and Furth, and victory in them should see St Pauli head for Christmas in the top two promotion places. 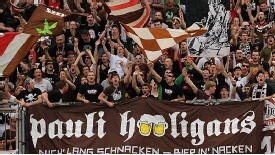 GGW will provide regular reports on how St Pauli succeed in this difficult post-relegation time.